The Board of Directors and staff of the Community Center for the Performing Arts (CCPA) wants to thank everyone who supported the 43rd Anniversary WOW Hall Membership Party held on Saturday, December 8. The members who attended this year’s event were treated to stellar entertainment and some of the best food and beverages the area has to offer. 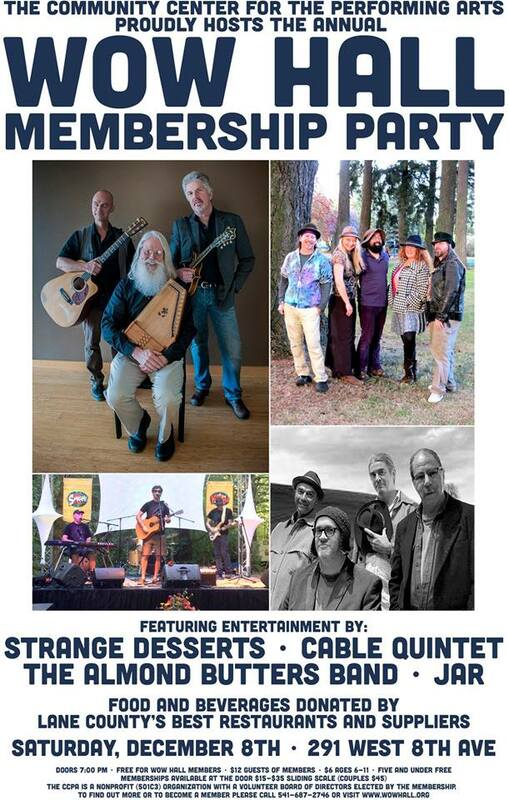 Thank you to our entertainers; all donated their services: Strange Desserts, Cable Quintet, The Almond Butters Band and JAR. Thank you to our business donors. Eighty-five businesses donated food, beverages and gift certificates! Donating businesses were announced from the stage and applauded by the audience. This annual event is put on to thank the members and supporters of the Community Center for the Performing Arts. The CCPA is a nonprofit, tax-exempt arts organization (501C-3; federal tax identification number 51-0191790) that enjoys the financial support of over 800 individuals, families and businesses in maintaining and operating the historic Woodmen of the World Hall as an all-ages performing arts venue. In addition, the organization benefits from the time commitment of hundreds of people who are active volunteers. Here’s a complete list of this year’s contributors. 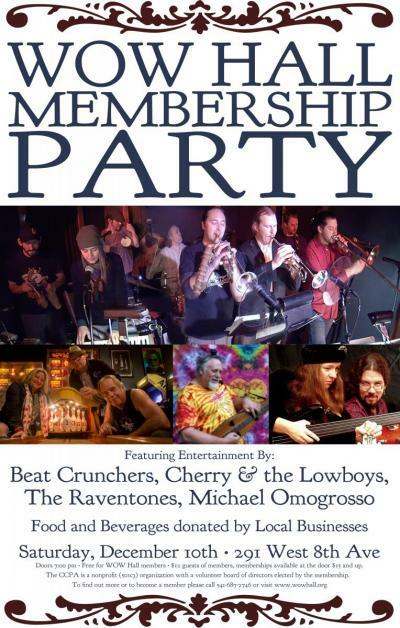 Please support the businesses and organizations that support our event, and if you have the chance, thank them for donating to the membership party. The Board of Directors and staff of the Community Center for the Performing Arts (CCPA) wants to thank everyone who supported the 42nd Anniversary WOW Hall Membership Party held on Saturday, December 9. The 200 plus people who attended the event this year were treated to stellar entertainment and some of the best food and beverages the area has to offer. 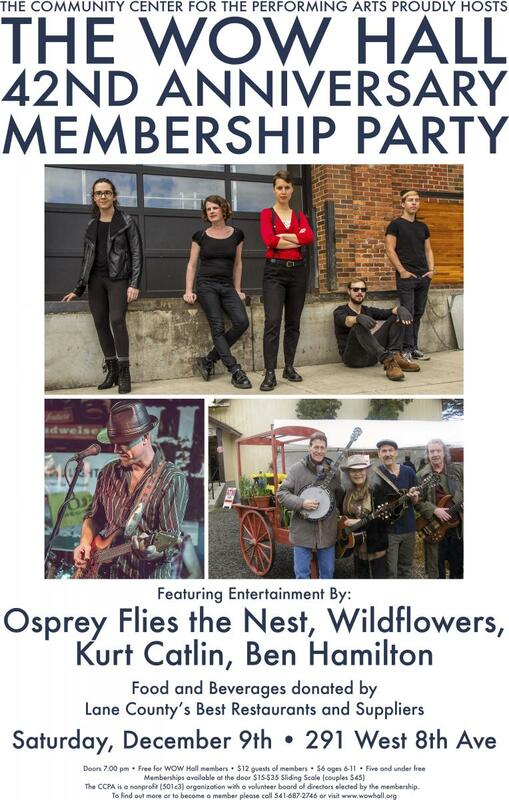 Thank you to our entertainers; all donated their services: Osprey Flies The Nest, Wildflowers, Kurt Catlin and Ben Hamilton. Thank you to our business donors. Eighty-six businesses donated food, beverages and gift certificates! Donating businesses were announced from the stage and applauded by the audience. The Board of Directors and staff of the Community Center for the Performing Arts (CCPA) wants to thank everyone who supported the 41th Anniversary WOW Hall Membership Party held on Saturday, December 10. The 200 plus people who attended the event this year were treated to stellar entertainment and some of the best food and beverages the area has to offer. Thank you to our entertainers; all donated their services: Beat Crunchers, Cherry & The Lowboys, Michael Omogrosso and The Raventones. Thank you to our business donors. Eighty-seven businesses donated food, beverages and gift certificates! Donating businesses were announced from the stage and applauded by the audience. 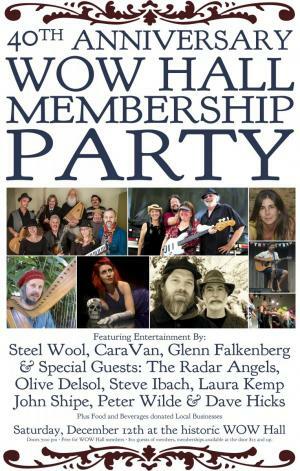 HERE IS A HISTORY OF WOW HALL MEMBERSHIP PARTY PERFORMERS. ALL OF THESE ACTS VOLUNTEERED THEIR TALENT FOR THE WOW HALL'S MEMBERS.